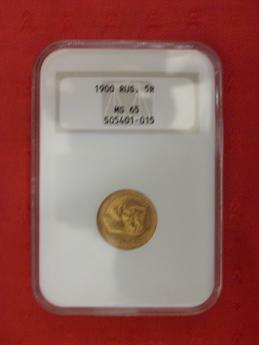 You are looking at a 1900 5 Gold Rouble graded by NGC MS-65. The front features the last Russian Czar Nicholas II. The back features the Russian Imperial double headed eagle. Great condition for a collectible coin that is 106 years old. KEY DATE, VERY LOW MINTAGE! Fantastic coin, unique opportunity, great investment. Do not miss a chance of a lifetime! The picture does not reflect the beauty of this coin. The weight of this coin is 4.3013 grams or .1244 ounce. Russian Imperial gold coin is a great addition to any collection or investment portfolio, not just for its brilliant content but also for its popularity with collectors.